The Honda HS521 snowblower is ideal for those looking for a long-lasting, dependable piece of equipment to take care of their snow and ice clearing needs. While it may be best suited for smaller tasks, it has plenty of features to get the job done. There are two models available. The HS521A which features a recoil starter, and the HS521AS, equipped with electric start. Both delivering five horsepower, the GX140 engine is capable of starting in the most extreme conditions. Combined with the speed control, continuously variable, hydrostatic transmission, the drivetrain is capable of clearing up to 33 tons per hour. Able to cut through snow and ice with its serrated, heavy-duty augers, it features a 20.6 inch clearing width, 12.7 inch clearing height, 32.8 foot snow throwing distance, and 1.4 hour operating time. The HS521 snowblower is built to last and perform at its best throughout its lifetime. However, just like any outdoor power equipment, eventually it will require maintenance or replacement parts. In order to decide which parts are best for you, it’s important to understand the difference between the two options. Original equipment manufacturer (OEM) parts are identical to the original parts used when your equipment was first produced. Just like the original parts, Honda OEM parts are manufactured according to EPA and California emissions regulations and the exact equipment specifications. Because of the higher quality of OEM parts, they may cost slightly more than the alternative. Typically, OEM parts are covered under a warranty. Aftermarket parts, on the other hand, are not identical to the original parts included when your equipment was first produced. They are not produced according to your exact equipment specifications or the EPA and California emissions regulations. So, they could impair the emission control system’s performance and potentially create safety concerns from possible equipment failure. Because of the lower quality, they are sometimes cheaper, but rarely include a warranty. To identify your equipment and find the proper parts, you will need your model and serial number. Typically, Honda snowblowers make their identification tags visible directly on the backside of the frame or lower handle. There are also visual diagrams that show where this information is located in your owner’s manual. The letters and numbers of the HS521A and HS521AS model names have meaning. 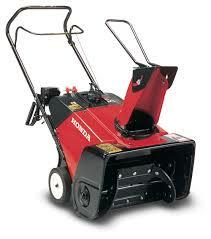 The “HS” simply stands for “Honda Snowblower”. The 5 horsepower is indicated by the “5” and the 21 inch clearing width is indicated by the “21”. American market production is specified by the “A”, and an electric start is indicated by the “S”. HondaLawnParts.com offers a variety of OEM parts for all Honda snowblower assemblies. Whether you’re looking to replace parts for your auger, hydrostatic transmission, recoil starter, or more, ordering is simple with our online parts ordering tool. The system allows you to find parts by diagram, or simply search by part number or model number. Our goal is to get you the right parts delivered quickly, so you can get back to clearing snow and ice in no time.